Ever feel like you’re so tired that all you want is some comfort food? You want something warm, that makes you feel like home. Something to satisfy your deepest yearnings and desires. Isn’t it the best feeling in the world to come home, and find that your grandma made your favorite dish? And you eagerly await to have that first bite. Comfort food will always be relative for every Filipino where they have their respective regional specialty dishes. A home-cooked meal with these dishes has special places in your heart. For those in Pampanga one of them is sisig, for those in Bicol they have laing, and for Bacolod, one of them is Kansi. So to begin, what is Kansi in the first place? Define Kansi /khan-Sy/ an Ilonggo version of bulalo; a cross between Sinigang(sour meat soup) and bulalo (bone marrow soup). 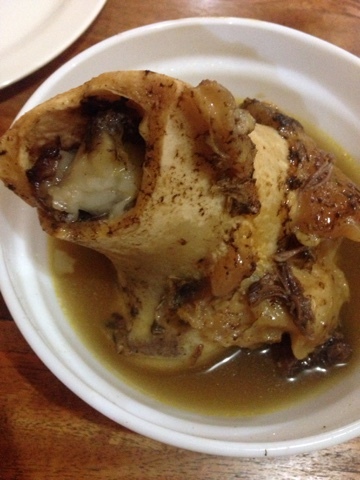 They first boil beef shank and bone marrow in a broth. then instead of using sampalok to make the soup tangy, the use the local batuan fruit found only in Iloilo. Pat Pat’s Kansi has been making their signature dish since 1999 in Jaro, Iloilo. In their Makati branch, the neighborhood itself is quite hidden but it actually has a few homes turned restaurants. A lot of their customers are those from Bacolod who miss their staple food, those in Manila who discovered their secret, and those foreigners trying something new and unexpected. The first time it was described to me, I couldn’t fathom how these two beloved classic Tagalog dishes would be made into an even more delicious dish. It would take some level of witchcraft, but it seems like Pat Pat’s has it down to the tee. I ordered the Kansi (Bulalo) as opposed to the Kansi(Laman) since I really like my bone marrow. As my order arrived I was overwhelmed by the size of the bone in front of me, served in a regular size bowl it looked humongous almost paleolithic. And when you peek inside, you can see that beautiful marrow peering out. The piping hot soup produces an aroma in the air that could only come from this delicious dish. On my first spoon full, my eyes widened, what could this be? Looking over to my friend, she encouraged me to take another bite. The rich meaty broth was perfectly balanced with this sort of sour tangy-ness of the batuan fruit with just a hint of sweetness. This first Kansi experience was the best Kansi experience. I had paired it with a cup of rice, and since I was feeling extra hungry for the meat, I also ordered the Kansi (Laman), while I mixed the oozing bone marrow on my rice. It was heavenly but deadly. You don’t even need to add patis or any sauce since the whole dish is flavorful enough. Another dish worth trying here is their fresh lumpia, where instead of having the sauce outside, In Iloilo they already put the sauce inside the lumpia. It’s a sweet balanced taste with a lot of garlic, that makes the difference than those you would find here in Manila. Admittedly, I ignored everything else we ordered because nothing came close to this. I would describe it as the thing I never knew I always wanted. This felt like home. Aside from their Kansi they also have a wide variety of other Ilonggo specialty dishes like inasal, and their lumpia. This is also something to try, as they are also authentic. Although the place is not really stellar. Pat Pat’s Kansi, takes your taste buds to another world with their melt-in-your-mouth marrow and tasty broth at only 155 a bowl. I love the way you introduce different foods and restaurants! I’m from the Philippines and your blogs will help me and my family a lot when we travel in different places here! Thank you for your comment! We just want everyone to have a good experience like ours. Glad to help! You’re welcome! I will keep on supporting your blog! We’ll continue to produce unique contents ?